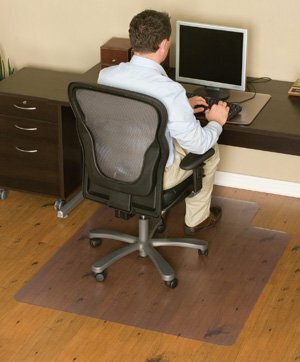 These deluxe, crystal color desk chair mats won't chip or curl and are non-flammable. Designed with a smooth backing, these chair mats are made to stay put on hard surface floors. Desk chair mats have crystal color clarity. LIFETIME WARRANTY on all Chair Mats against cracks due to normal wear and tear. Desk chair mats are 0.145" (145 mil or approx 1/7") thick and work well on any hard surface including hardwood, vinyl, tile, marble and terrazzo. Custom chair mat shapes and sizes available. Please call for more information. NOTE: A "lip" is defined as a protrusion or extension from the edge of the mat. The lip protects the floor under the desk where the chair may roll if scooted all the way in. NOTE: Chair Mats with a lip are listed using the overall size of the mat including the lip; thus, the rectangular portion of the mat is smaller than the corresponding size listed.